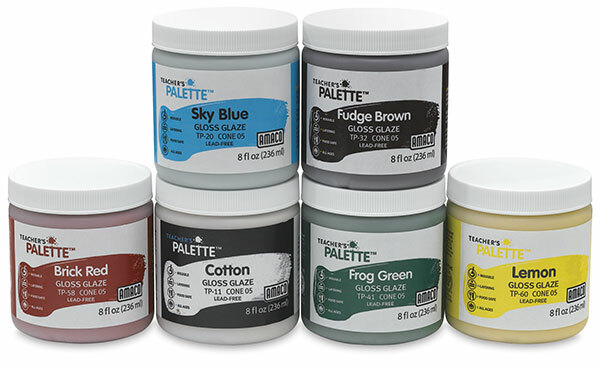 These one-step gloss decorating glazes are a great value — and they bring a palette of bold, vibrant colors into the classroom. Ideal for glaze layering and design, Amaco Teacher's Palette Glazes are lead-free, easy to apply, they mix well (with each other and with Amaco Teacher's Choice glazes), and they produce consistent results at Cone 05. 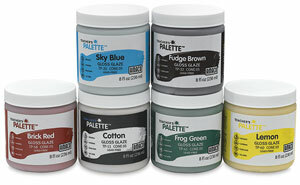 Teacher's Palette Glazes are designed for artists of all ages. Class Pack #2, Set of 12 — This class pack contains 12, 8 oz containers of glaze, one in each of the following colors: Coal Black, Cotton, Gray, Sky Blue, Midnight Blue, Blue Green, Caramel, Mint Green, Grape, Raspberry, Pig Pink, and Carrot. Class Pack #5, Set of 12 — This class pack contains 12, 1 pint containers of glaze, one each of the following colors: Coal Black, Cotton, Midnight Blue, Medium Blue, Robin's Egg, Frog Green, Granny Smith, Green Leaf, Lilac, Scarlet, Maize, and Pumpkin. Class Pack #3, Set of 12 — This class pack contains 12, 1 pint containers of glaze, one in each of the following colors: Gray, Sky Blue, Blue Green, Caramel, Fudge Brown, Mint Green, Grape, Raspberry, Pig Pink, Brick Red, Lemon, and Carrot. Class Pack #4, Set of 12 — This class pack contains 12, 8 oz containers of glaze, one each of the following colors: Coal Black, Cotton, Midnight Blue, Medium Blue, Robin's Egg, Frog Green, Granny Smith, Green Leaf, Lilac, Scarlet, Maize, and Pumpkin. Class Pack #1, Set of 6 — This class pack contains six 8 oz containers of glaze, one each of the following colors: Cotton, Midnight Blue, Fudge Brown, Frog Green, Brick Red, and Lemon.